Recently I cleaned out my freezer and found a few bags of berries from over a year ago. Likely more than a bit freezer-kissed but I wanted to still use them and knew I had to find a use for them ASAP. Although they might not taste so great in a smoothie or in yogurt, these berries would be cooked with a little sugar and lemon- disgusing their imperfection. 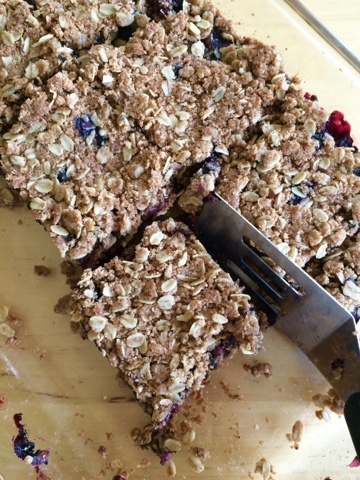 I adapted this recipe from Epicurious to make it the way I wanted it- a thick, hearty square with a delicious mixed berry filling. It is great served warm for a simple dessert. When cool, it makes a great bar for school lunches or taking to book club or knit nights. You can use almost any frozen berries you have on hand and whatever jam you have on hand. They are sure to turn out perfect every time. Strawberries are a bit too moist for the main berry but can be used as the jam. The tartness of raspberries or blackberries is a nice counterpoint to the slightly sweet crust. These can be wheat-free if you use spelt flour. 1. Preheat oven to 350 degrees. Butter a 9 X 13" glass baking dish. 2. Combine oats, flour, brown sugar and baking soda in a medium-sized bowl. Add melted or softened butter and stir until combined. Press half of crust mixture into pan and bake for 15 minutes. 3. In another bowl, stir together berries, jam, flour, lemon zest and juice. 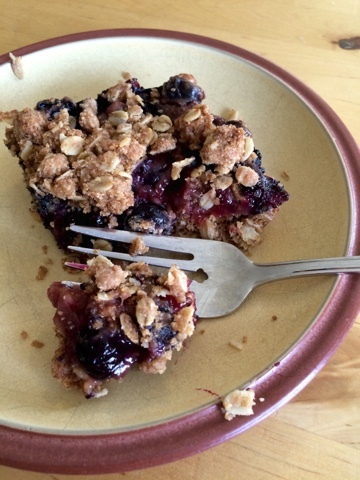 When crust comes out of oven, spoon berry filling on top. Sprinkle topping over and gently press down on topping. 4. Bake for another 25-28 minutes or until top is golden and filling just starts to bubble at edges. Refrigerate until cool enough to cut into squares.